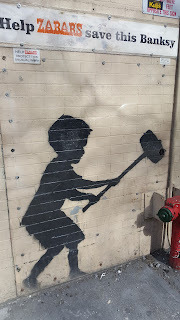 In a well-illustrated talk Professor Paul Gough will examine how street artists such as Banksy maintain some element of control over their public art works. Arguably the most renowned ‘unknown’ street artist in the world, Banksy has had to balance the free availability of his street art with protecting the exploitation of his images by others. This talk focuses on the protracted negotiations between the Banksy, his ‘Office’, and Gough in his attempt to compile a book about the artist’s work. The talk examines the controls demanded by the painter’s agent, the attempts to manage the ready availability of imagery, and the difficulties in seeking the necessary permissions from an artist who deals almost entirely through proxies. In 2012 Professor Gough published the book Banksy: A Bristol Legacy. Professor Gough is the Pro Vice-Chancellor Design and Social Context and Vice-President at RMIT. A painter, broadcaster and writer, he has exhibited widely in the UK and abroad, most recently in Canada, New Zealand and Australia, and is represented in several permanent art collections – including Imperial War Museum, London; Canadian War Museum, and the National War Memorial, New Zealand. Please join us at Swanston Library for what promises to be an enthralling tale, plus there'll be a chance for a Q&A with Paul at the end. Drinks and nibbles provided. All welcome. Read up on Paul Gough and Banksy, available through RMIT University Library.